The full SR5 bass guitar, showing the new Global GUI tool, fretboard monitor, the performance view for the 'string 1' main instrument, the remaining main instruments (minimised) and the first few 'add‑on' instruments. 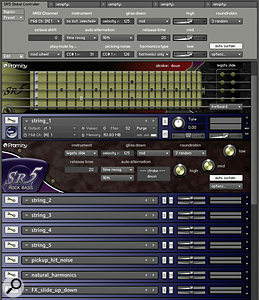 Japanese company Prominy are well known for their SC and LPC Electric Guitar virtual instruments. Their latest product, SR5 Rock Bass, drops down a couple of registers to join a growing legionette of virtual bass-guitar instruments hosted by the ubiquitous Kontakt Player (see the 'Alternatives' box). At the heart of SR5 is a 24‑bit, 15GB core sample library of approximately 14,000 samples, expanded from 8Gb of real world data using NI's .ncw lossless compression format. 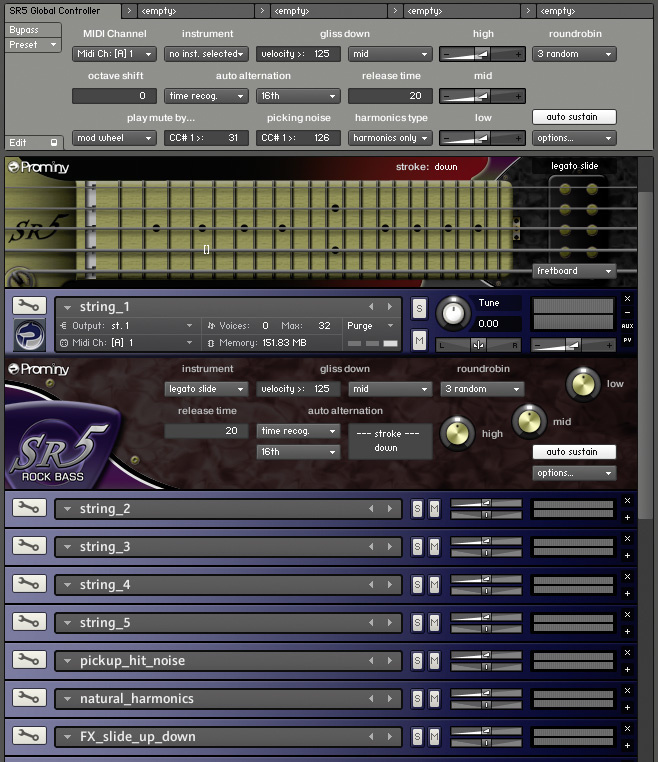 As with Prominy's virtual guitar products, the aim is to recreate authentic‑sounding bass-guitar performances, both in terms of sound and of detailed performance techniques, as easily as possible, through live performance on a MIDI keyboard. The bass guitar Prominy have chosen to sample for SR5 is a Musicman Stingray, notable for being a five‑stringed instrument with a range going all the way down to a low 'B'. Following a similar format and concept to the SC and LPC Electric Guitars, the complete, fully detailed SR5 Rock Bass instrument is constructed from 14 separate patches within a Kontakt Multi, all running on one MIDI channel. The patches fall into two categories; 'Main' instruments (the five strings, each having its own patch) and keyswitchable 'Add‑On' instruments (harmonics, release noises, scrapes, slides and other distinctive bass-guitar noises). There are four playing articulations available to the Main instruments: legato slide (sliding between notes when played in a legato manner, with three selectable slide speeds), single (no slide), hammer‑on/off, and repetition (notes retrigger when released). These are supplemented by muted and picking articulations, controllable optionally by mod-wheel position or velocity range. While certain events are handled 'intelligently' by KSP scripting (for example, string selection) the majority of sounds are activated manually by keyswitching. However, string selection can also be overridden using keyswitches to force notes to play on specific strings if required. SR5 plays in a monophonic, legato mode by default; once a note is played, its sound continues either until another note is played, or until the sample reaches its natural conclusion. Alternatively, notes can be terminated using 'stop' and 'hold' keys. These each trigger different release noises: fret slide, downward glissando or pick noise, for example. The user can customise these release noises if they choose, re‑assigning their locations or even disabling them altogether. Unlike many virtual guitar instruments, SR5 has no 'strumming' feature, hence no strumming trigger keys. However, the instrument can be played polyphonically by disabling the default monophonic 'auto sustain' mode, either via a MIDI CC command or by pressing the MIDI sustain pedal. The full instrument also includes a fretboard monitor module, providing helpful visual feedback of stroke direction, fret position and string selection. SR5 Lite provides six different release and picking noises, which can be assigned to the 'stop' and 'hold' keys in any combination you like. SR5's library is organised very simply. The Multis folder contains only two patches: the complete, fully‑articulated instrument, SR5_Rock_Bass.nkm, described above, and a 'lite' version, unsurprisingly named SR5_Lite.nkm. For situations requiring less detailed control, the 'lite' Multi presents SR5 in a slightly less RAM‑hungry cut‑down form, as a single patch. In this version, the key mapping of the five strings is fixed, with no option to 'force'-select specific strings (thereby requiring considerably fewer samples). The main articulations (legato slide, single, hammer‑on, repetition, mute and pick) are all available as before, plus six release noises assignable to the Hold and Stop keys. This lite version is nevertheless very expressive and capable of very convincing results. The Instruments folder contains the individual Main and Add‑on instrument patches. These can be loaded as required in any combination to construct a custom Multi suitable for the application you have in mind. Prominy have sampled their Musicman bass with great clarity; the samples have oodles of sustain, and plenty of top end to work with. Plectrum strokes are clearly defined, and there's just the right amount of buzzes, fret rattles and other details to give interest and a sense of urgency to the sound. In order to avoid the dreaded machine‑gun repetitions (a vital consideration in rock and metal styles where rapid note picking is typically commonplace), round-robin sample randomisation brings a degree of 'natural' tonal variety, with up to four cycling modes available. Settings '3' and '4' deliver increasingly wilder tonal variations, with the result that heavy emphasis is frequently applied at inappropriate moments. This is most noticeable when SR5 is heard 'clean', although the inconsistencies become less obvious with compressed, overdriven amp settings. If you're after a more even tone, the '2' setting is the most effective. Round robin can also be disabled if you need a super‑consistent 'workstation' bass sound. Even then, the sound isn't entirely lifeless, as SR5 features up/down plectrum strokes with automatic stroke detection This syncs to your song's tempo at a variety of selectable note values, adding further to the sense of animation and tonal variation. Plectrum strokes also can be forced to play in one direction for a more even, emphatic sound. The cut‑down SR5 Lite version is contained within one Kontakt patch, yet still provides the main playing articulations and enough detail to create a convincing bass guitar performance. Despite the seemingly complex keyswitch learning curve, SR5 is, in fact, very easy and quick to learn. Its liveliness of tone makes it ideal for all forms of energetic rock music when treated through a good bass-amp simulation, and I even found it capable of producing the classic 'belching' sound beloved of prog rock bands — a sound I've tried many times to emulate in the past, but never as closely as this. Despite its patently rock and metal intentions, I found SR5 worked perfectly well in a variety of genres — although you may have to massage your amp settings accordingly to make it fit into more gentle styles of music! Native Instruments produce a highly respectable and growing range of bass guitar instruments that includes the Scarbee MM‑Bass, Pre‑Bass and Jay‑Bass. Other front‑runners include Trilian, Chris Hein Bass, Liquid Electric Bass and Vir2 Basis. Of these, only Trilian uses a proprietary sampler engine as opposed to being hosted by Kontakt and the ubiquitous Kontakt Player. Heads up, Kontakt 4 users — if you don't already know this, you're going to want to. The following may seem off‑topic with regards to SR5, but in fact it's extremely relevant. Not only does the update to version 4.1 load instruments faster than before, it also brings an excellent new facility, Play Whilst Loading. This feature enables even large, 'Giga'-sized instruments to be played immediately from the moment the instrument appears in the Kontakt GUI — even huge instruments that would normally take several minutes to load. If you play a note whose sample has not yet been loaded, Kontakt streams it from disk on the fly, whilst continuing to load the rest of the instrument. This is very convenient for those moments of great haste or impatience, but it also provides one truly welcome benefit for those of us struggling to run multiple monster‑sized 'RAM Hog' Kontakt instruments on a 32‑bit PC with the maximum 3GB of accessible RAM. The problems typically arise when your RAM is already chock‑a‑block with sampled instruments, but there's still that killer Dagenham Girl Pipers Kontakt instrument that you simply have to include as the icing on the cake. Trouble is, you only need half a dozen notes from it, but to access those, you're obliged to load the entire instrument. Frustratingly, our Girl Pipers are far from being size zero — they need to gobble up 600MB of RAM! Normally, a workaround might be to render everything else to audio to free up memory, but what a pain that is when you want to keep everything running 'live'. Not any more — simply follow this indispensable tip from the Dr Magnus clinic. In a spare 10 minutes when you and your computer are otherwise idle, load one of those RAM‑hungry instruments into Kontakt. When loading is complete, open the instrument's Purge menu, and select Unload All Samples. You'll notice there is now a red indicator showing no samples in RAM. Ordinarily, you'd expect to hear nothing when you play any notes, but now, when you play your MIDI keyboard, there they are, streamed instantly from disk, loading on demand. Now all you need to do is make sure all samples are unloaded once more, and re‑save the 'empty' patch under a new name. Next time it's loaded (which happens very quickly) no RAM will have been consumed at all. Only the notes you actually play from that point onwards are loaded into RAM, and you'll find your Dagenham Girl Pipers part will probably only consume about 10MB, leaving loads of room for other instruments. So as far as SR5 is concerned, you should always be able to take advantage of the full instrument with all its articulations, if you follow this simple preparatory procedure. The originally shipped version 1.0 of SR5 has now been updated to 1.01. This adds a new Global GUI tool, allowing the settings for all instruments within the SR5_Rock_Bass.nkm Multi to be adjusted simultaneously from a single set of controls. Previously, any adjustments made to one instrument in the Multi had to be manually duplicated across all the other instruments. Additionally, a transpose button now makes life a lot simpler for owners of shorter keyboards who found it awkward to access the keyswitches at the lower end of the keyboard. High-quality, detailed and lively sound. Well suited to rock, metal and progressive genres, also adaptable to many other styles. Keyswitch functions are easy to learn. Demanding on RAM, especially with Kontakt versions below 4.1. A lively‑sounding and very playable virtual bass guitar instrument featuring many controllable, characteristic bass-guitar artifacts. Although its tone is optimised for all forms of energetic rock, given suitable treatment it also adapts well to many other genres.